It may surprise those who have never had the pleasure of visiting a Middle Eastern country to find out that roses are ever-present in beautifully manicured gardens with signature reflection pools and water fountains. The Middle East is not the dry, desolate desert they will have you believe. Dreamlike memories of Iran fill my mind with visions of a lush field of wildflowers playing audience to the porch that ran the length of my aunt’s country villa near a rocky river in the mountains. The porch held a very important role in the family’s social structure. It was where guests were received and treated to freshly brewed tea poured from the samovar that stood at attention, ready to serve. In the hot summer months, it was customary to sleep under the stars, in a modest bed laid over ornate Persian rugs. The soft chirping of the nightingale and trickle of the water fountain summoned slumber as the sweet smell of the roses and orange blossoms filled the night air. These memories are real treasures from my childhood with my grandparents in Iran that I want to share with Daisy. We like to bake together, decorate the house together and even tend to the roses in the front yard now and then. It’s fun watching her moving things around. Just this morning, she moved a couple of tall candle holders off of a low china cabinet and set them on either side of the arched entryway between the living and dining rooms. I never would have thought to put anything there. So clever. She is always up for anything creative. Sugared fruit have always caught my eye. They’re just so elegant, with that modest sparkle under certain light. The problem I have with sugaring anything is that the “glue” is often raw egg whites and I worry about bacteria. Thankfully there’s meringue powder which is made of dried and pasteurized egg whites. Your local craft store will likely have the Wilton brand. Edible glitter adds a little sparkle and may be easier to find online than at the craft store. When I told Daisy the plan, she jumped at the chance to help right away and did a stellar job. We made sparkly white petals, red petals and pink petals in honor of Pinktober. They all turned out beautifully, so dainty and sweet. In a small bowl, mix meringue powder with water until blended. Fill the other bowl with sugar and edible glitter. Mix to combine. Gently rinse the rose petals and set them to dry on a paper towel. Dip the brush into the meringue mixture and coat a petal evenly. Transfer the petal into the bowl with the glittered sugar. Use the spoon to sprinkle the top of the petal with sugar. Carefully set the petal onto a clean surface to dry. Store dried petals in a clean glass jar until ready to use. Now that Fall is officially here, the holidays are not too far away. We have been setting out our pumpkins, cute owls, baskets and pine cones, decorating our front porch and warming up our home. Food is also becoming more festive and while I love savory, you know I’m only just waiting for the sweet that follows. The beautiful roses in full bloom in our front yard gave me an idea. Middle Eastern pastries are often perfumed with rose water. Preserving the petals in sugar would serve as lovely decorations for some cupcakes we were baking and give a little hint of the otherwise unexpected rosy flavor in the icing. They are so easy and fun to make, especially with the kids. Crown a cake with these pretty petals, nestle one into fluffy frosting swirled over a cupcake or just replace the old faithful cherry on top for a fresh take on hot fudge sundaes. We love them nestled into buttercream frosted Lemon Ricotta Cookies. Get the easy recipe here! Awesome. Awesome. Awesome. LOVE this! Hi Coco, oh I love this, such a fabulous idea!!! 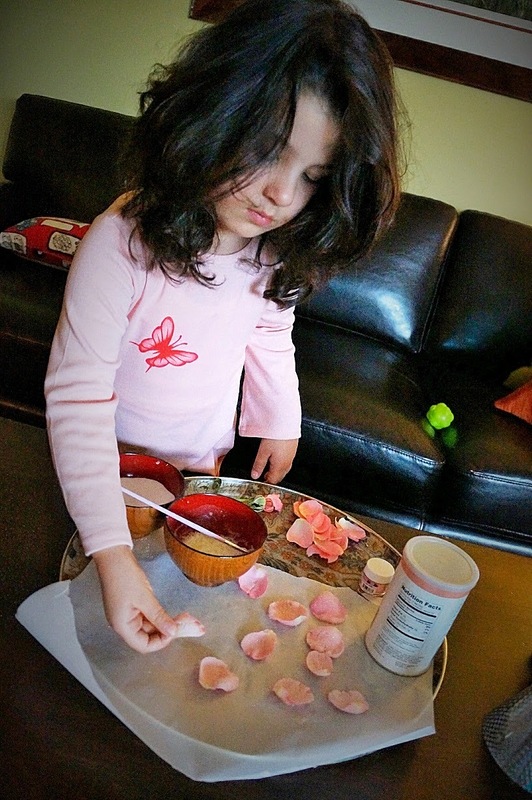 Colette, we have a rosebush in our gardne with light pink roses that have an amazing smell and I always make candied rose petals with them during the short time that they bloom – it is such a fantastic treat and so beautiful too. Looks amazing! Did you use some special tool like this: http://www.coolutils.com/TotalImageConverter for your photos?